Customer called us to install a new anode rod for their 40 gallon gas hot water heater. The anode rod is used to help protect the heater from rusting. 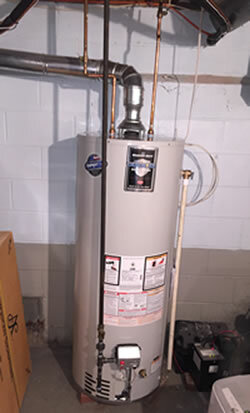 The customer lives in Webster where they have very hard water, so they change out the anode rod every three years to help preserve the life of their hot water heater. The customer’s heater has been working and performing well for twelve years. For the best new construction plumbing services, call GT Campbell Plumbing, LLC. We service Pittsford, Perinton, Victor, Penfield, Canandaigua, Webster, Rochester, Fairport, Brighton, Irondequoit, Greece, Chili, Gates, Henrietta, Palmyra, Newark, Farmington, Geneva, NY and neighboring cities. 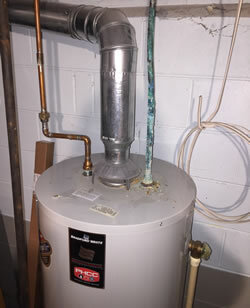 Upon inspecting the water heater we noticed water seeping from the cold water supply line going into the heater. The water line was heavily calcified and there was corrosion starting on the top part of the heater where the cold water line was seeping into it. We advised the customer to consider replacing the heater with a new one due to the condition of the old tank. 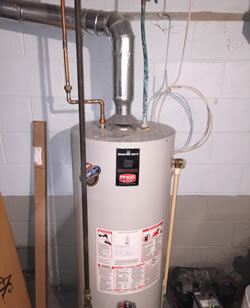 Customer not only decided to replace the heater but also decided to upgrade from a 40 gallon to a 50 gallon gas hot water heater. We drained the water from the old heater and started to disconnect it. We installed 2 new ½” ball valves, one for the cold water supply and one for the hot water discharge so we could isolate the tank and turn the customer’s water back on to the house. (This was so they could use their sinks and toilets while we worked on installing the new hot water heater). We proceeded to install a new 6 year warrantied Bradford White 50 gallon gas hot water heater. We’ve used Bradford White heaters for the past eleven years as they have been a very good and reliable water heater. We replaced the water line going into the new water heater and we replaced corroded piping on the hot side also with new ½” copper lines. Since the new 2015 hot water heaters are about 2” wider than the old heaters, we had to realign the gas line to connect into the gas control valve for the heater. 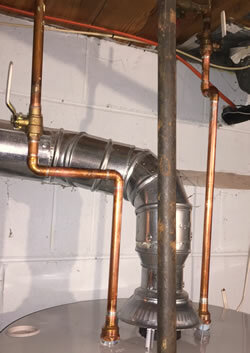 We also had to adjust the flue pipe to accommodate the height of the new hot water heater. After connecting the new tank, we let it fill with water and bled the air out of the heater and the water lines. We were then ready to fire up the new heater. After igniting the heater we checked for gas leaks and made sure flue pipe was drawing exhaust fumes properly. After the installation we informed the customer they would have hot water within 30 to 40 minutes. The customer was quite pleased! !